How to Grow the Garlic herb. Garlic was originally a native plant of many thousands of years ago. Evidence of it has been found in caves inhabited more than 10,000 years ago. Medicinal prescriptions were found chiseled into a clay Sumerian tablet that was more than 3,000 years old. Garlic is a key ingredient to a wide variety of recipes, and is quickly becoming regarded as a natural method to prevent heart disease and cancer - it is after all the second oldest medicine in the world. 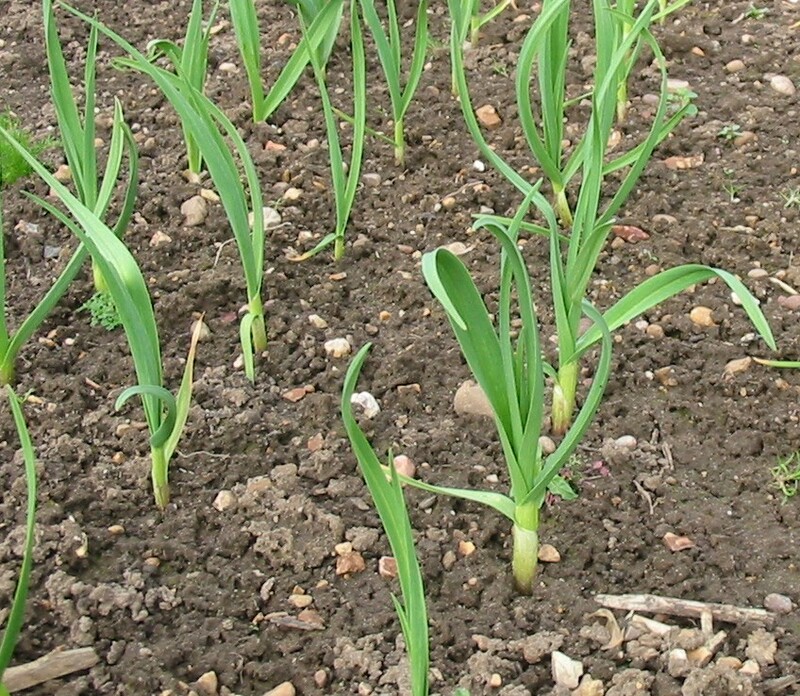 Growing garlic is well-suited to both the first time gardener and the more experienced - given the correct soil and planting time, common garlic is relatively maintenance free, yet some of the more unusual varieties provide a challenge. 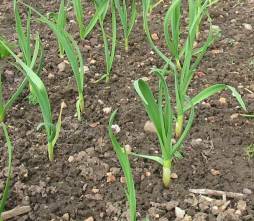 Garlic can be planted in raised beds and they will grow very well. Click here to go to our page on raised beds. The secret to growing garlic is to plant it in mid October - spring planting is possible in warmer areas, but even then, better sized bulbs will result from an autumn sowing. Dig the soil well to a spade's depth before planting, incorporating as much organic matter as possible to assist with drainage - garlic will rot in water-logged conditions. If you can purchase and dig in some sand (from your garden centre) at this stage, the drainage will be improved even further. A couple of handfuls of bonemeal should also be incorporated every square metre (yard). Garlic bulbs for planting in Spring need not be bought from a nursery - simply choose the largest ones possible from your greengrocer or supermarket. If planting in mid October, choose a hardier variety such as 'White Pearl', these need to bought from your local garden centre. Each bulb will consist of up to 20 individual cloves, and it is these cloves which are to be individually planted. Gently remove the outer skin from the bulb (not the cloves) and separate into individual cloves - see the picture on the left. 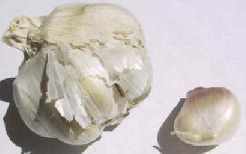 On the right is a garlic clove and on the left is the bulb. Select the largest eight or so of the cloves which will be on the outside of the bulb. Plant each of the cloves in an upright position 2cm (1in) below the soil surface. Looking at the clove in the picture to the right, the bottom blunt end of the clove should be lowest in the ground with the pointed end just below the soil surface. Space each clove about 10cm (4in) apart. If you are planting rows, space each row 45cm (18in) apart. Click picture of foliage on Garlic 'Supreme' to enlarge it. Garlic is normally ready for harvesting when most of the foliage has turned yellowy-brown - this will be around mid August time. The problem with harvesting garlic is knowing when they are ripe - harvest too early and the bulbs will be small, harvest too late and the bulb will have split making harvest difficult and the cloves of low quality (they will have commenced their growing cycle for next year). When harvesting garlic bulbs, gently ease them out of the ground with the assistance of using a trowel to loosen the surrounding soil - be careful not to bruise them with the trowel because they will then not keep for long. Message: The garlic should be OK. They're just like bulbs emerging. Message: I planted garlic this fall in Northern Virginia. the weather has been milder than usual and there are now green shoots. WIll the garlic die this winter or is it okay? Message: i read your article on garlic i said thank for your advise. Message: They'll be fine. Leave them over winter, not much will be going on until spring. I am looking at planting some garlic and was wondering which time of the year would be ideal for this. I am in Zimbabwe, that is Southern African Region. Summer starts in September. Rains start failing in November through to February/March. Is this time, the right time. 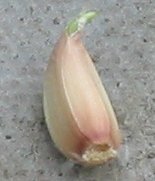 Garlic is normally planted on the shortest day and harvested on the longest. If the soil is frozen, plant in spring. Yours may need protection, cover with straw, frost cloth, etc. Message: Hi, I live in Central Switzerland and planted my garlic 3rd week of September. The shoots are now ca. 4 inches tall. Have covered my raised bed with thick perspex panels. Is this sufficient for winter with snow and minus degrees? Look forward to your reply and best wishes. Message: hi sir i am from kodaikanal i want to konow what type of fertilizer we have to give for garlic to get a big clove & wat type of varity is suitable for hills . Message: I planted bulbs in May/June, they have now lost all their leaves. Should I dig them up or leave until next year? Message: Pls can you help me to know how to plant garlic in my area.My area is hot and we only have cold from nov.-feb. which time is good for garlic to plant?. or can garlic be good during hot season? Message: Most of my garlic grown over the winter here in CA was ready for harvest this week. However, about a third of the garlic have not formed bulbs and are sprouting a new bunch of green leaves. Each clove underground seems to be putting out new leaves. Did I miss the harvest for these bulbs? What if I leave them in the ground? What will happen? Message: If I planted cloves in April, in a warm climate, when should they be ready to harvest? Message: I cut of the flower bulb last year from a garlic plant. I let it dry until last month. I planted 3 or 4 in a pot, and now they have sproted. Will I get a good quality garlic from these? What would be the best time to get them started? Message: I read somewhere that you should gently uncover the bulbs around the surface once they are big enough while they are ripening. Is the right? I planted mine in November and they are already quite big. The leaves are now going yellow. It's been hot so will they be ready early? Message: Like many aspects of gardening, growing garlic from seed seems to be a well gaurded secret but with a little perseverance you can find snippets of information from various sources. In reply to growing from bulbils it seems that this is the best method for disease free bulbs because if you continually use cloves from the same original bulb, year after year, health problems can occur. Of course if you can get 70 bulbils from one plant that's got to be cheaper than buying 3 or 4 bulbs from the supermarket. Message: please send me best practices of vegetables and spices cultivation. Message: I find that Garlic will even grow in between other plant no problem! The absolutely best garlic is fresh from the ground (known as wet garlic). This garlic is sweeter, less pungent and far more digestible than dried garlic. So make sure you use some cloves as soon as possible. The majority though should be be washed and dried and then placed in a warm dry place in the garden (bring indoors if rain threatens) to dry out - these bulbs should keep in good condition for 3 months or more.